Don’t you just love fast and easy home decor ideas that add seasonal flair to your home at very little cost? Me, too! 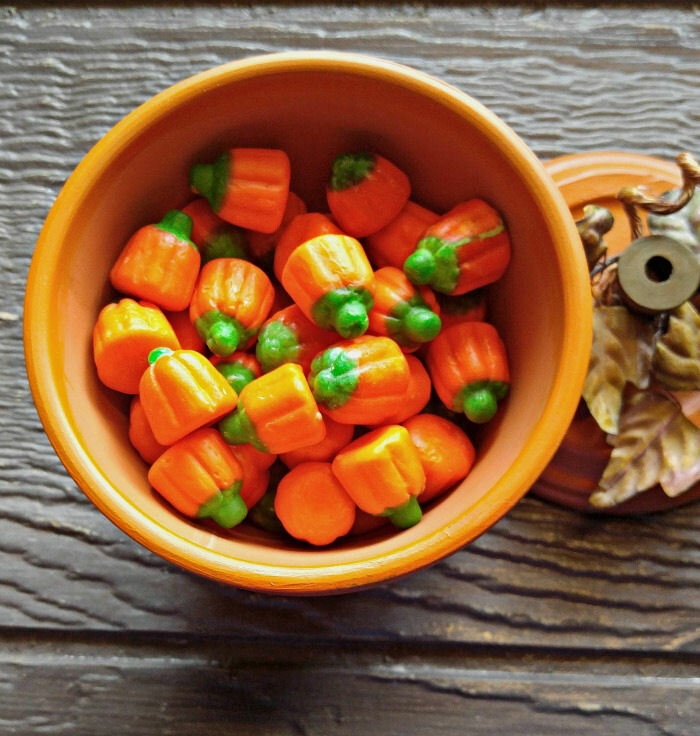 This clay pot pumpkin looks great as a decor item and also does double duty as a candy dish. Win – win in my book! Thanksgiving tablescapes often make use of a centerpiece that gets showcased in the middle of a table. This idea would make a perfect addition to any holiday table. I love working with clay pots. I always have a variety of sizes of them hanging around that are left over from working with succulents and the shape of them and their shape just lends itself to all sorts of holiday ideas. I’ve made a lot of fun projects with them and have many more planned. Even old pots will work as long as you clean the clay pots well. 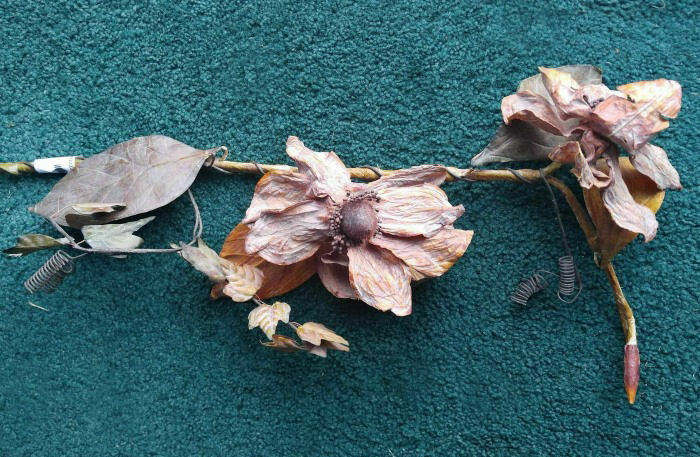 I visited a thrift shop over the weekend and came home with a decrepit looking stem of dusty brown silk flowers for 99c that had seen its better days. But it had very nice detail on the leaves and I figured I’d find a way to use it somehow. My husband wondered if I had lost my marbles when he saw it. I had no plans for it until I started on this project. The color is just perfect for my pumpkin stems! This has to be one of the quickest project I have done in a long time. 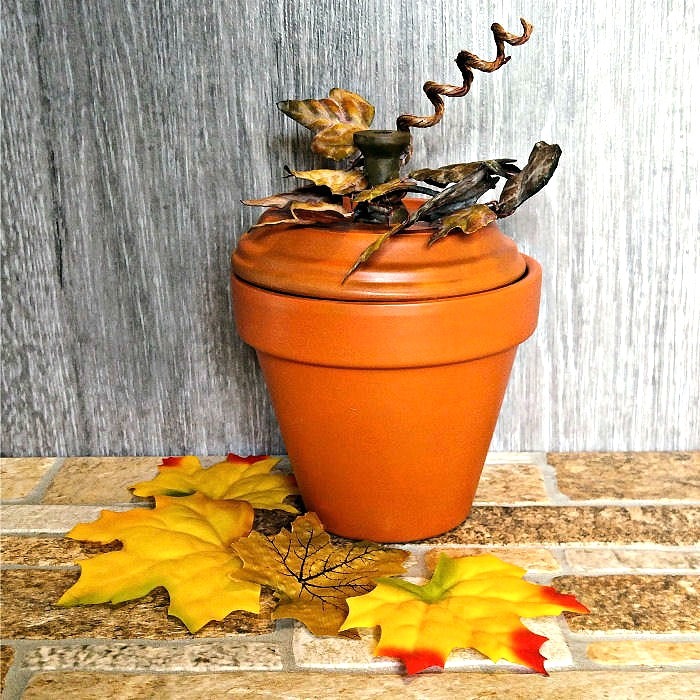 The only real time is drying time and if you like the color of your clay pot, you don’t even need to do that! 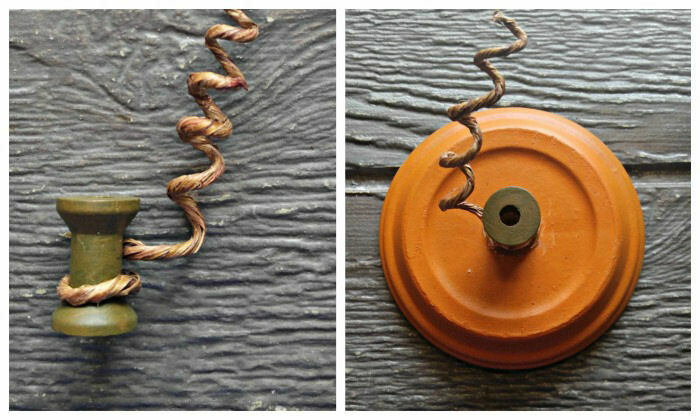 I used a 4″ clay pot and saucer, some wire rope, craft paint, a few silk leaves and a wooden spool. 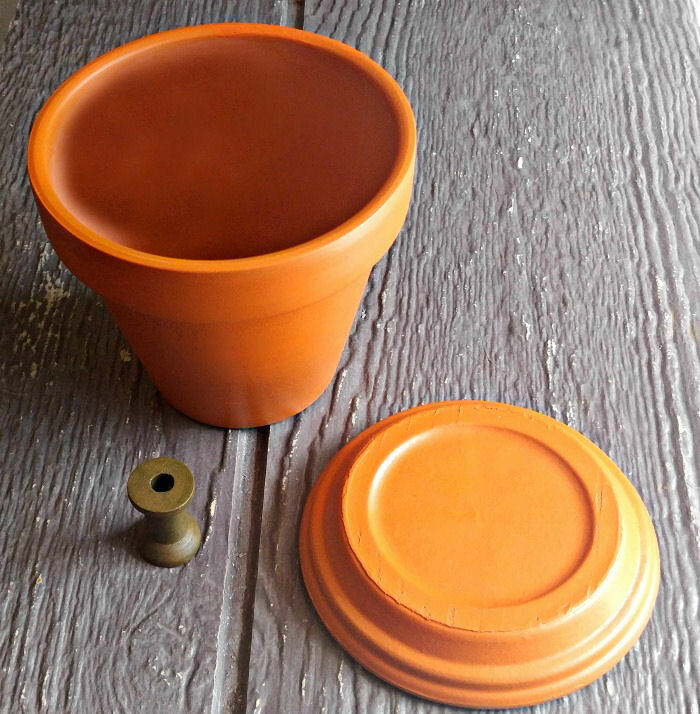 First I painted my pot and saucer orange and combined black and orange paint to get a greenish – brown color that I wanted for my spool. When the paint was dry, I assembled the stem of the pumpkin. 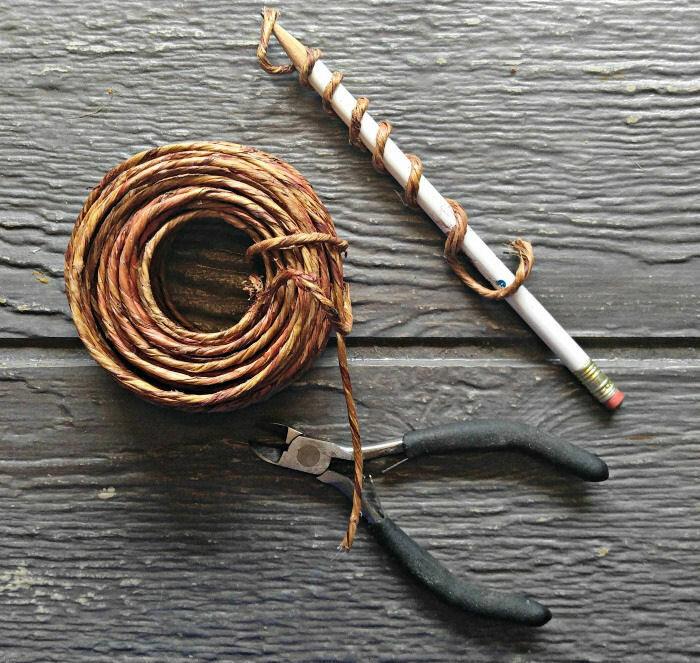 First I wound the wire jute around a pencil to give it a nice curled shape. Then I wrapped this around my spool and tacked it in place with some hot glue. A quick dab of hot glue on the center of the upside down saucer holds the pumpkin stem in place. I cut two nice pieces of leaves off my old dried flower stalk and tacked them on both sides of the spool. I used a nice dusty brown color that looks nice with my spool stem. NOW my thrift shop purchase makes perfect sense. Isn’t the detail lovely? 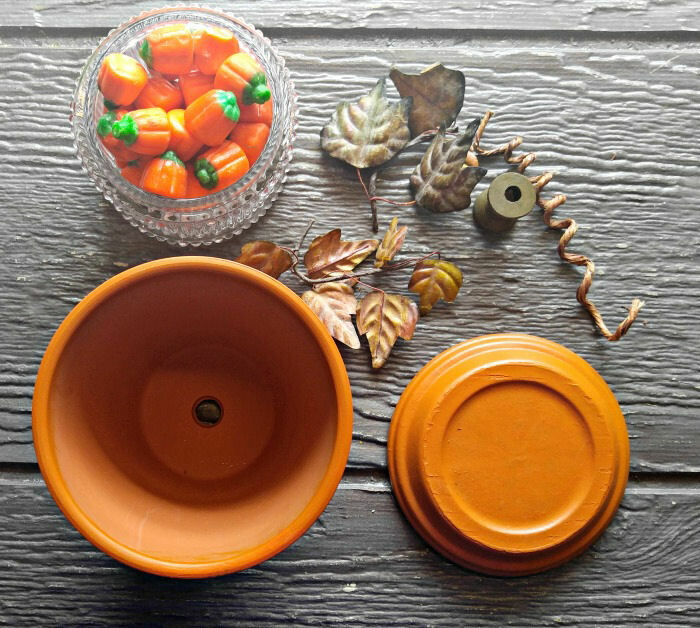 All that was left to do is to fill the clay pot pumpkin with candy pumpkins and pop on the lid. Tada !! All done in less than a couple of minutes! 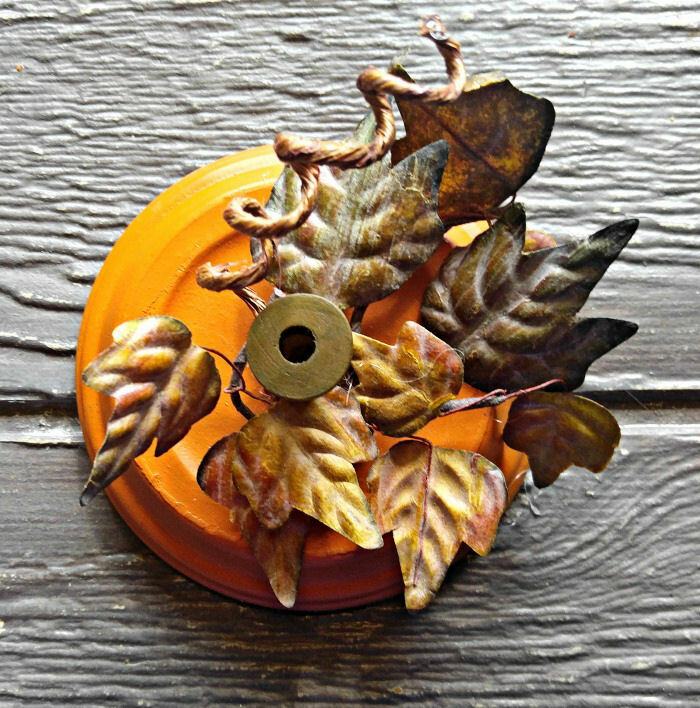 I LOVE that this looks just like a pumpkin decor item but it secretly holds the candy inside it. Who would ever guess? What fun! Now it was time to stage my clay pot pumpkin. 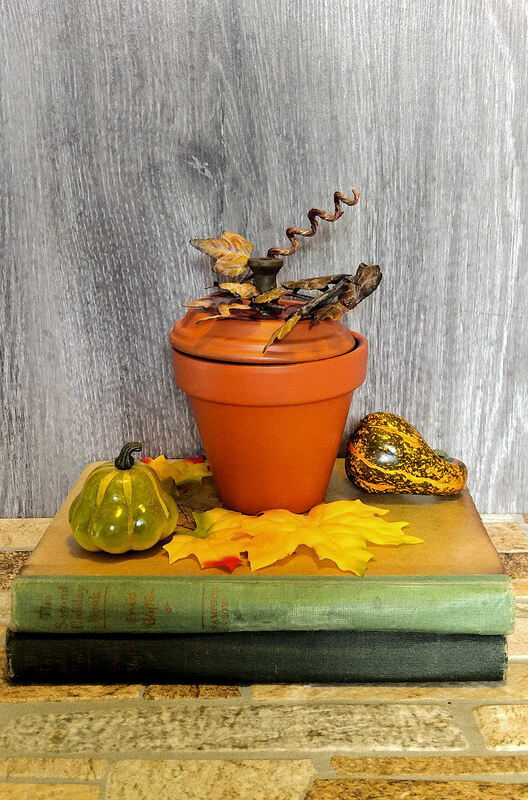 I used a couple of old books, some faux gourds and silk leaves and ended up with a very pretty fall vignette that will be perfect for either Halloween or Thanksgiving. If you have an hour (or less if you don’t paint) of spare time and an old clay pot, make your own pumpkin today. 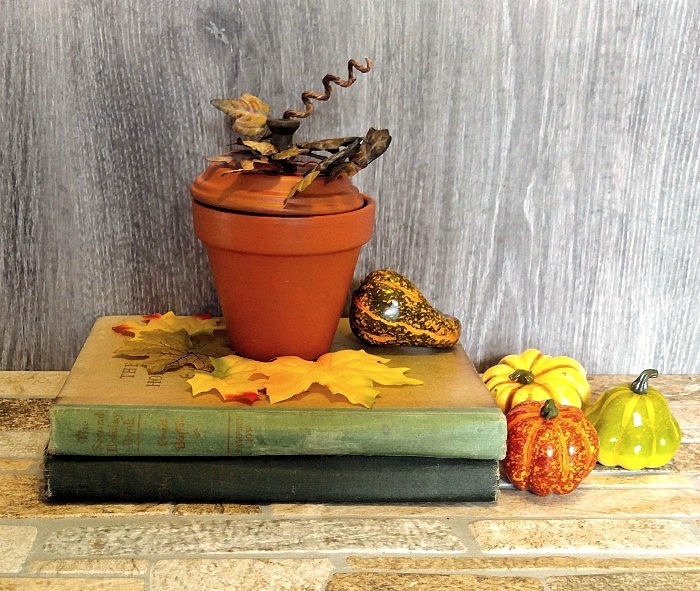 The vignette would be perfect on a fall mantle! 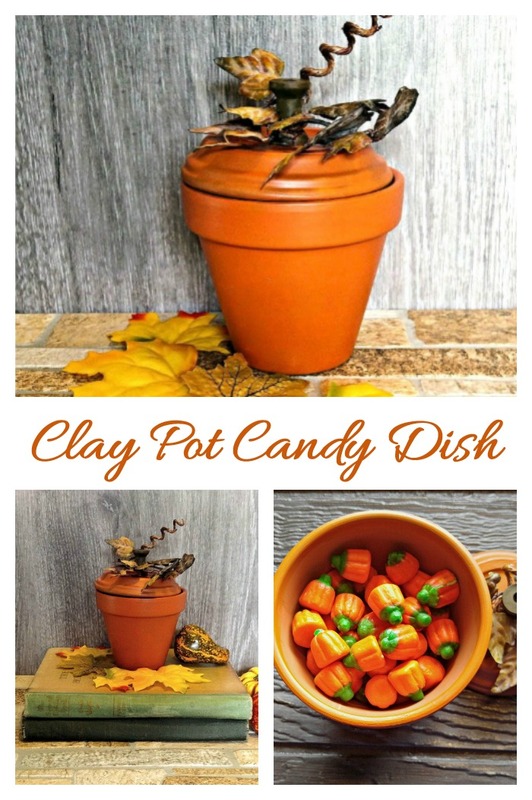 Would you like a reminder of this clay pot pumpkin project? Just pin this image to one of your Craft boards on Pinterest so that you can easily find it later.